Watercolored flowers say spring to me. Today is another of those gloomy days we've been having and I've been dreaming about sunshine and planting flowers. So, since gardening is out, I made a card instead. I started with a white piece of card stock and cut the edge with a edge die from PTI. Using a text stamp inked with Chai ink, I stamped the background randomly. The flowers were colored with waterbased markers and stamped, then darkers highlights were added. I decided to use a kraft card base, but the white card stock looked a little harsh. So I used the Chai ink to tone it down and added a bit of darker color with Pumice distressed ink. The sentiment was stamped in Chocolate, and the flowers were highlighted with a pearl pen. A bit of latte twine finished the card front. I edged the kraft card base's front edge to match, then adhered the finished card front. A bit of the kraft hangs out, which added a nice finish. On to the inside, I used a piece of Rustic Cream card stock, stamped a few flowers and added it to the inside. This card will probably go into my Operation Write Home stash, which is why I lined it. But I must say, I really like finishing the insides of my cards. I think it gives a nice finished look to the project. I hope you're spring has started on a brighter note than ours has. And, as they say, may all your weeds be wildflowers! LOVE that trick of highlighting with the marker after you've stamped the flowers and leaves! The cut card edges look fabulous - definitely eyecatching and sure to please an OWH recipient (for both the giver and the receiver). Beautiful card Kathy! That edge is such a gorgeous touch and i love the flowers and the writing. Hi Paula! Thank you for the sweet comment. I don't often remember to pull out my edge dies, but always like the results when I do. Beautiful card - inside and out! 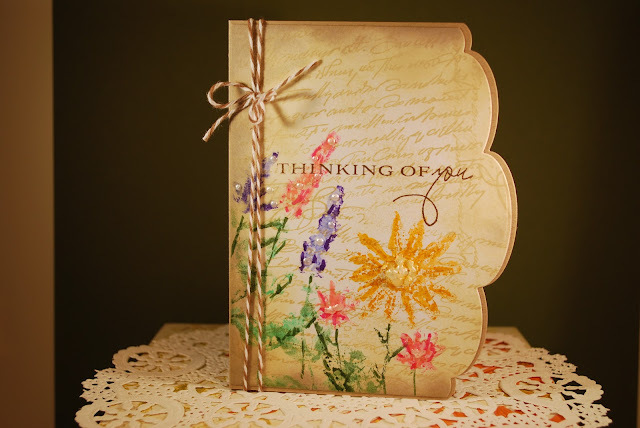 I love the angle of the text stamping and the extra coloring of the stamped flowers. The decorative edge is such a wonderful finishing touch. Thanks for playing in our Midweek Throwdown Challenge at Operation Write Home Stars & Stamps! Very pretty card!! I love the stamped flowers inside and out! Pretty card...;love the edges and the image! TFS!!! So very pretty Kathy, I like the shape of your card too! Thanks for playing in our Midweek Throwdown challenge at Operation Write Home!